James Abbott, professor of audio engineering at the Rose, Jules R., and Stanford S. Setnor School of Music in the College of Visual and Performing Arts, has been selected as a fellow at the Burton Blatt Institute (BBI) at Syracuse University. Fellow appointments provide select and accomplished faculty the opportunity to collaborate with BBI on innovative projects related to their disciplines, with impact for people with disabilities. 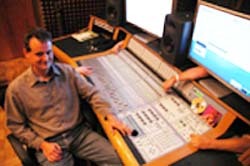 Abbott is a graduate of the renowned music engineering program at the University of Miami. His work can be heard on NPR, PBS, Centaur Records, New World Records, Composer’s Recordings (CRI), Albany, GM, Sanctuary Classics (Black Box), Victor, Mark Records, Innova, Naxos, Koch Classics, Raven Records, Summit, Warner Brothers and Endeavor Classics. His clients include many well known ensembles, organizations and musicians, including the Syracuse Children’s Chorus, Boston Brass, Cassatt String Quartet, Corigliano String Quartet, Thomas Lanners, Glimmerglass Opera, Cleveland Chamber Symphony, Civic Morning Musicals, Syracuse Society for New Music, Andrew Russo, David Cossin and Hilary Hahn. Widely considered to be a specialist in the recording of new music, he has recorded the work of many renowned composers, including Libby Larsen, Augusta Reed Thomas, Gabriela Frank, Ross Lee Finney, David Lang, Gunther Schuller and John Corgliano. A recent project recording for Black Box Records, John Corigliano “Violin Sonata Etude Fantasy” with Andrew Russo, piano, and Corey Cerovsek, violin (2007), received a Grammy nomination in the Best Chamber Music Recording category. In 2010, a project he engineered for the Syracuse Society for New Music released on Innova Records, “Serendipity,” won a 2010 Syracuse Area Music Award (SAMMY).